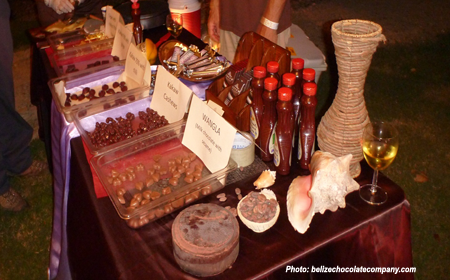 BELIZE CITY–Sugar, citrus and bananas constitute Belize’s leading agricultural exports, but Government officials are looking into the possibility of export diversification with an indigenous Maya favorite: cacao. Michael Singh, chairman of BELTRAIDE – the Belize Trade and Investment Promotion Services, said that yesterday, he drove out to the Old Hummingbird Hershey farm which now has 400 acres of cacao. “We see the possibility of growing cacao and chocolate as an industry that could be equal to citrus, because of land availability and the suitability of this kind of production,” said Singh. “What BELTRAIDE has been doing through Export Belize is to pick a focus area within the export capability and to put everything we can into building that capability,” he added. Singh said that they did it with the business process outsourcing (BPO) industry, growing it to 18 companies and 3,500 employees because they focused on that as a service export. “Cacao is an area that I think we are going to put a lot of focus on in trying to build a strategy, put a policy in place and find financing for the little parts of that strategy which can help to create the kind of groundswell, so we have more production of cacao, eventually more value-added production of Belizean chocolate,” Singh said. He explained that they are focusing on export areas for which Belize has a competitive advantage. “We are picking the gems and the low-hanging fruits and going after them,” said Singh. Singh spoke with the media on the sidelines of a forum which BELTRAIDE convened at the Radisson Fort George Hotel with a group of established Belizean producers, with the aim of linking them up with financiers that could help them boost production and tap into their export potential. The forum stems from a project through which Belizean producers were provided with advisory services under an initiative dubbed FINPYME®, a group of technical assistance programs seeking to support SME competitiveness in Latin America and the Caribbean executed by the Inter-American Investment Corporation (IIC), a member of the Inter-American Development Bank (IDB) Group. According to Singh, Export Belize has focused on building capacity and getting companies that are export-ready or close to export-ready to expand their base. One such business, he said, is Quality Poultry, which has been very successful in having 50% of the chicken market in Belize, but which is able to double production to expand into the export market. Today’s BELTRAIDE forum, said Singh, put Belizean companies that are looking to expand together with lenders such as Scotia Bank, the Development Finance Corporation (DFC) and the Inter-American Development Bank (IDB), which today reviewed the business proposals. Program documents explain that companies that want to participate in the program should have been operating for at least three years and should have annual sales of more than US$400,000. “FINPYME ExportPlus selects SMEs that are eligible to receive support for their export-related activities. Their operations and business plans are analyzed, and they receive technical assistance,” the documents explained. Organizers say that next year, 2015, the IIC is planning to again carry out the Strategic Planning Program (4-5 phases), and 2 group technical sessions as well as 10 individual technical sessions will be offered, benefiting an estimated 60 companies in Belize.